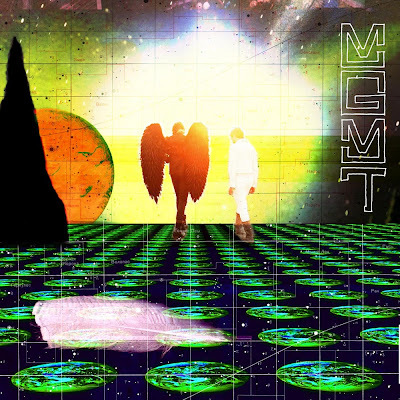 space I'm a bit behind on this album post but I finally had some time to listen to MGMT's (pronounced as the letters M-G-M-T) new record this weekend. Oracular Spectacular came out in late January but I wasn't in a hurry to get it since they have been so hyped already. I can be a bit wary of new, highly-hyped bands because they more often than not end up being a let down. I finally got a copy of it and I am wondering why I waited so long. Hearing it really makes me regret not seeing them open for Of Montreal in Lawrence last year, even though I had my fill of Of Montreal live for a while. MGMT's debut album was produced by Dave Fridmann who has handled some of the best psychedelic pop bands in Flaming Lips and Mercury Rev. MGMT could be compared to either aforementioned band but to me they seem like a younger version of Ween. Just like Ween, MGMT can do the psychedelic folk thing, the R&B thing, the dance pop thing and the weird thing all one song after another without it sounding like some random mix tape. After quite a few listens I keep coming back to the second track, 'Weekend Wars', maybe because it's a beautiful song but probably because it sounds like a lost, great Bowie song and I can imagine him singing it himself when I hear it. To be honest, there really aren't any weak songs on this album and it's a lot better of a debut than Vampire Weekend. That's not to say MGMT and Vampire Weekend sound anything alike, because they don't, but they are both bands releasing their debut's to a lot of hype around the same time. With Vampire Weekend, although I love it, I don't see myself listening to it much after a few months. On the other hand, Oracular Spectacular sounds like an album that I will keep coming back to for a long time. It just has that feel, and if you are a music fan you probably know what I'm talking about. I dig this album too!!! Yes, it's a great album that gets better with repeated listens, unlike Vampire Wknd, which bores after about three spins. Their name is pronounced M-G-M-T, by the way, not "management," as so many have written. You are correct sir (on both counts: the name and the rewarded repeat listens). Good lookin out!